I decided to share with you on making a handbag in the style of “borough”. I will be happy if this workshop will be of use to you. I tried to explain everything step by step. 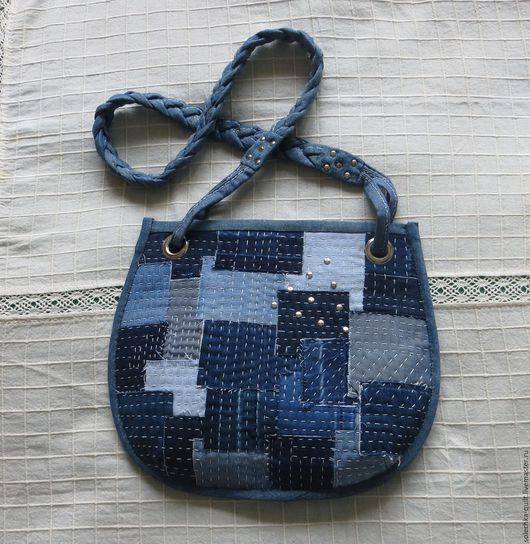 Complexity is average, such handbag can sew and beginner needlewoman. Grommets and press for their installation (you can pierce the eyelets in a leather shop or in a shoemaking workshop). 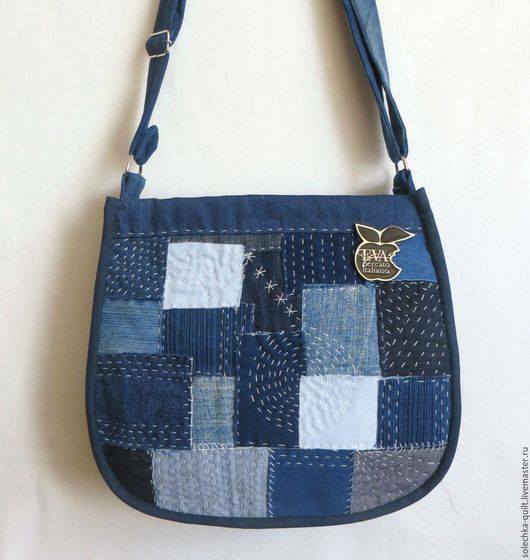 You can do without installing eyelets, just sew handles to bags. Thread No. 10 or Micron 20s / 2. Napkin viscose or another dense substrate. Doublerin or dense fleece (glue). Well, all have prepared, proceed. 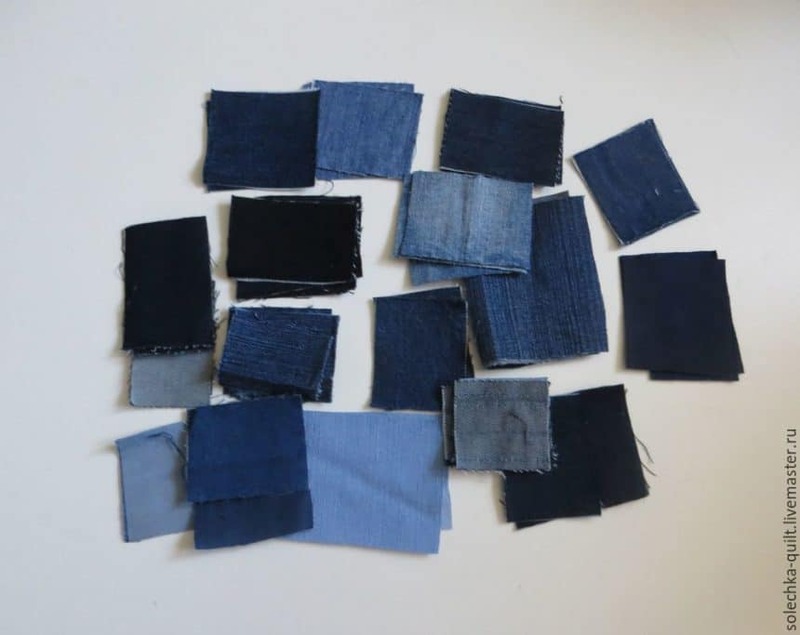 We cut rectangles of any size from our denim fabrics. 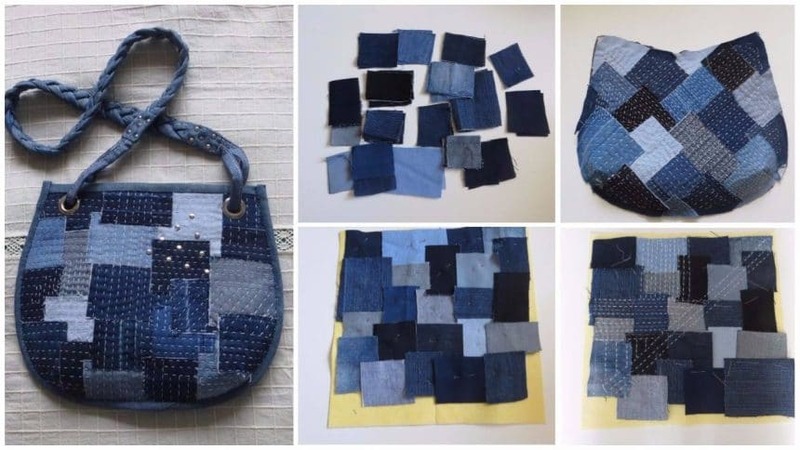 You can use old jeans. Now take the base fabric (I took a viscose napkin) on the purse size of the purse. 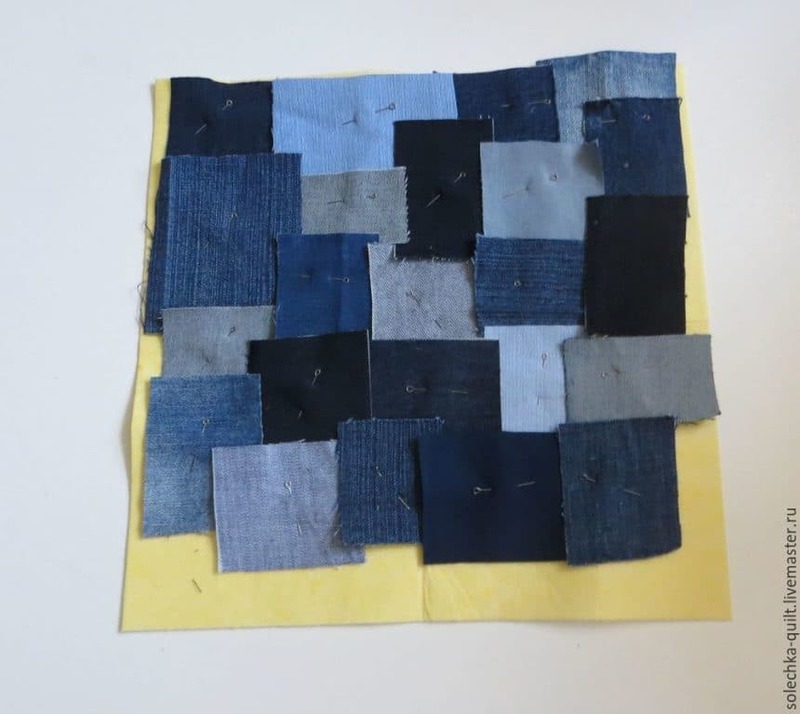 We lay out our scraps as we like, then fix them with pins so that they do not run away. 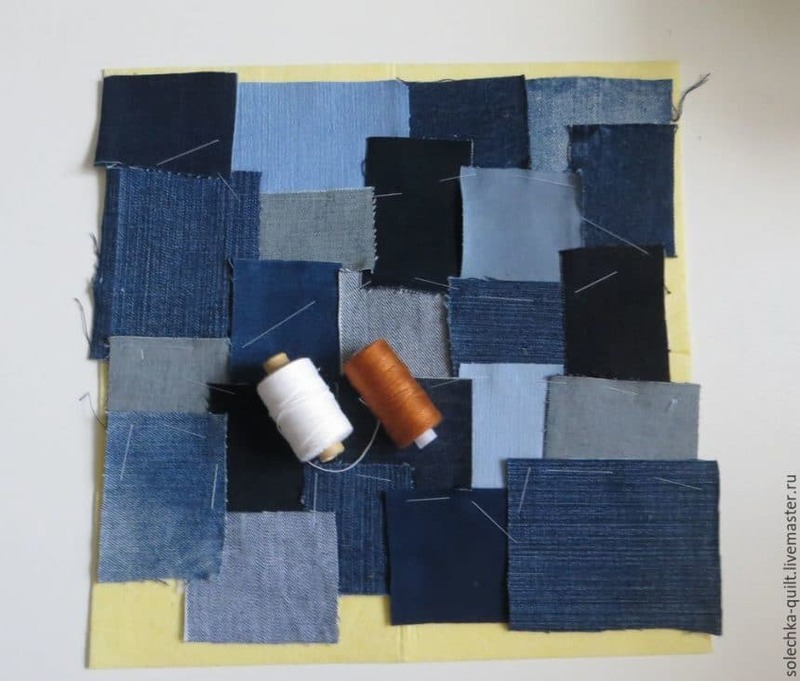 With pins, it’s dangerous to quilt (they just strive to stab into your hand), so it’s better to fasten our scraps with thread. Next, we select the thread for the stitch … №1 0 will do. We will have 2 such blanks. 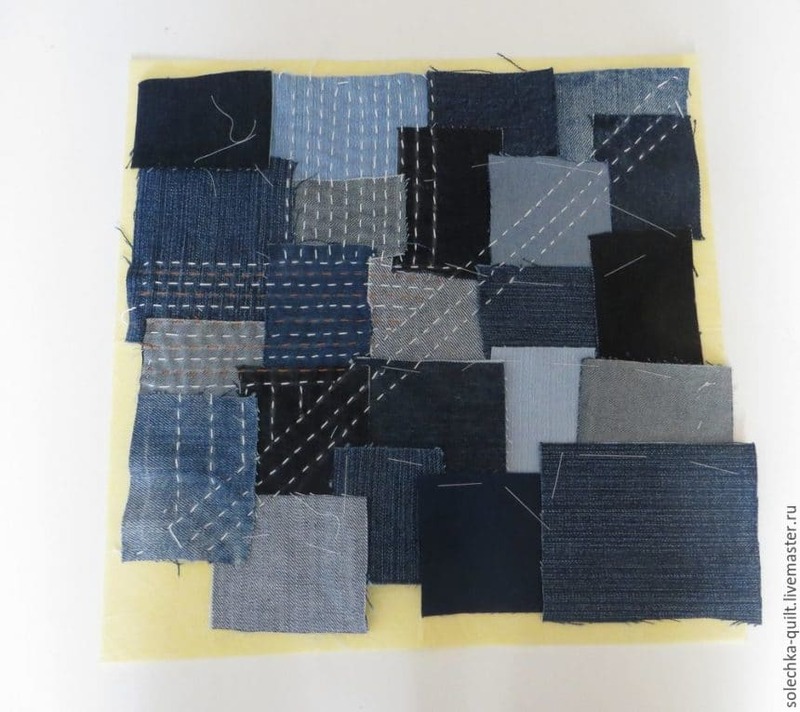 We plan (draw) the first line and proceed to quilt our workpiece. Well, here we include the imagination and write out the stripes as we please … We will try for ourselves a beloved. Well, that’s about it. We lay flat little threads of one or several colors. Stitches (preferably) should be the same length. You can only thread one color, and you can alternate 2 or more thread colors. 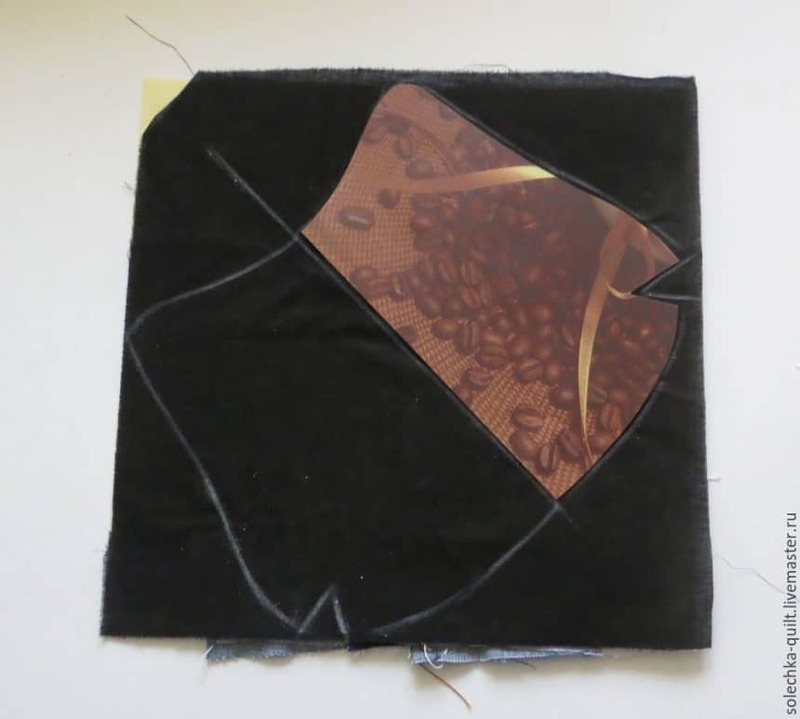 Stitching is arbitrary, that is, on the second workpiece, the drawing should not necessarily repeat. 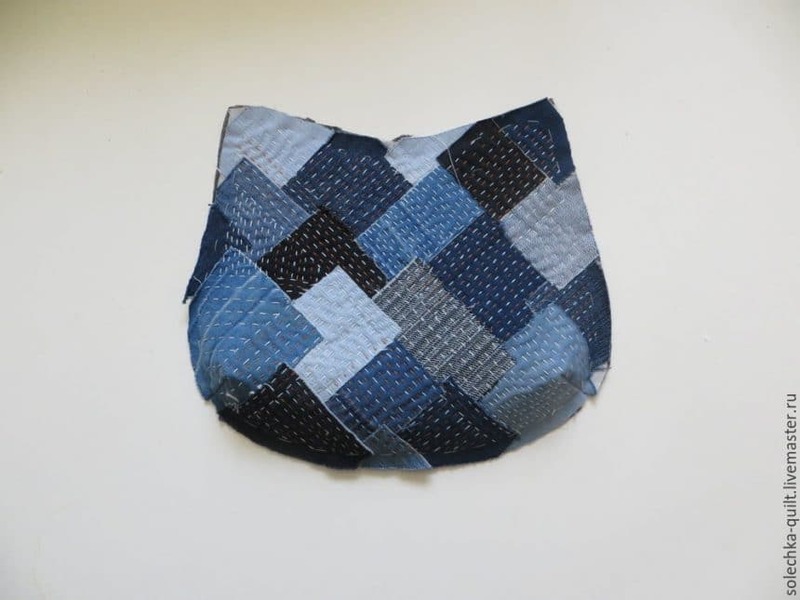 After we quilter our workpiece, it must necessarily be duplicated (a double ring or non-woven fabric is suitable), this will give it density and strength. From paper cut out a pattern (you choose the shape yourself, who likes what). The trowel is cut out 4 cm deep and 3-4 cm wide. On the workpiece, we draw the line of the middle (I decided to draw it diagonally), apply our pattern to it and draw the contour of the future handbag. That’s the way. Just draw and on the second workpiece. Cut all the unnecessary, sewed darts, and that’s what we got. The front part of our purse is ready. Now you need to prepare the inside of the purse. 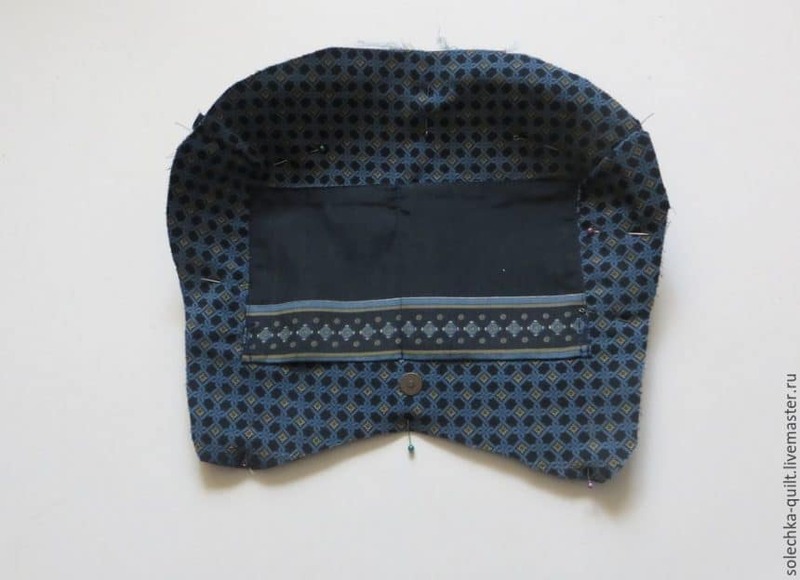 For the same pattern, we cut out the fabric prepared for the lining (two parts). 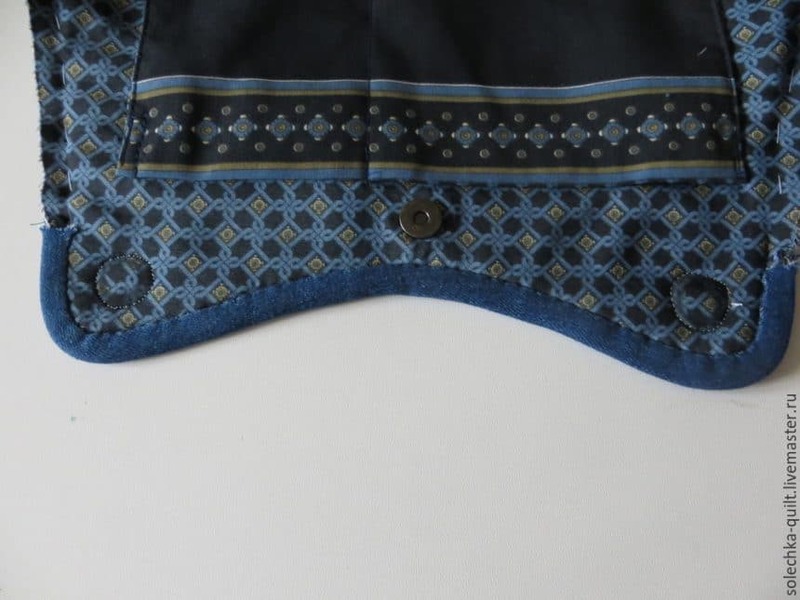 We sew pockets to them, we stop darts. We also duplicate the inner workpiece. Let’s note, where we will install the magnetic buttons and on this place, we will paste a small circle of doublers (for density). Install the magnetic buttons. Now add 2 blanks – external and internal and chip pins, and then sweep (for reliability). 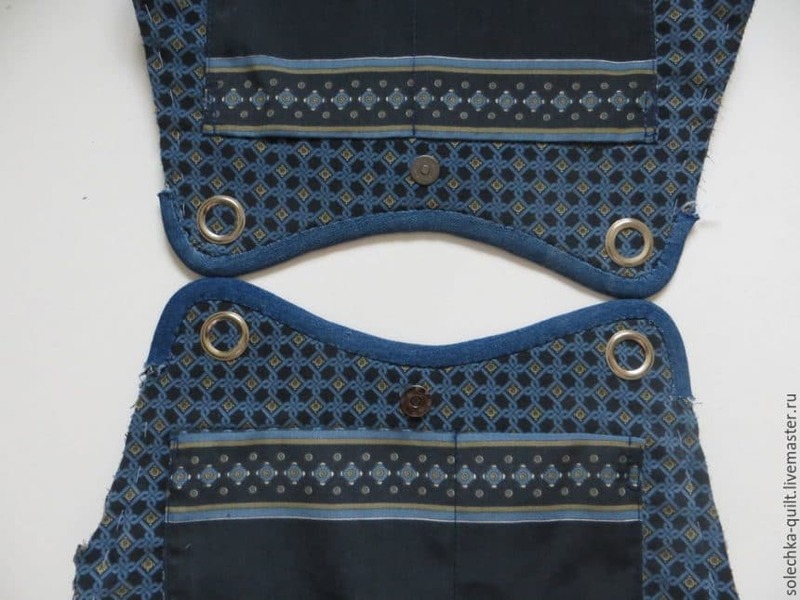 We cut out a slanting béchku and bend only the upper part so that the “ears” for the eyelets turn out. The height of the ears (where the ends) is 6 cm. We attach eyelets. Draw the inner circle. 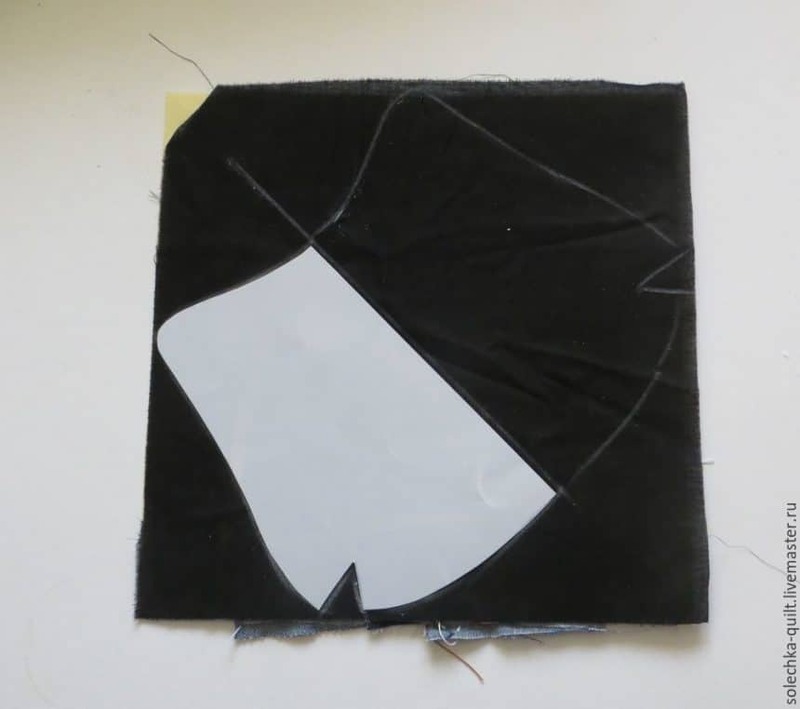 Now, along with the line of the circle, it is necessary to flash (to fix the fabric), since we will cut the holes for the eyelets. 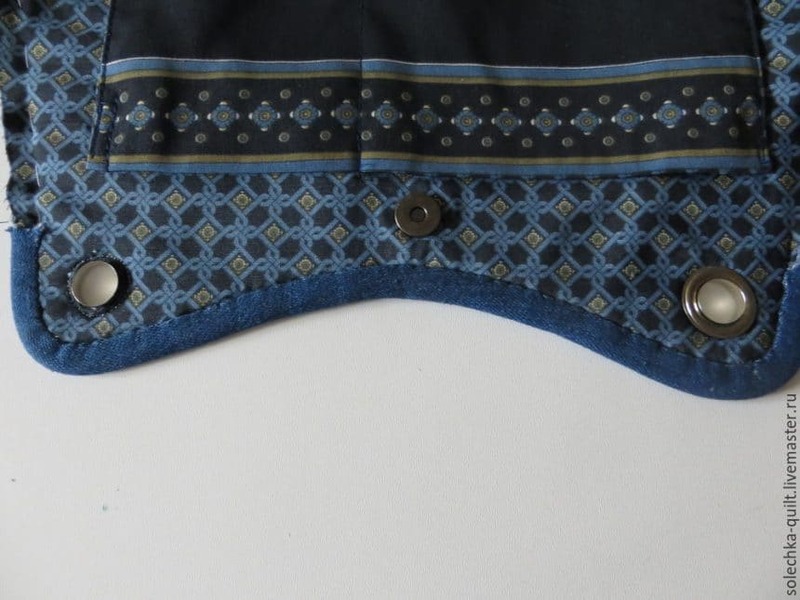 Cut out the fabric near the line, insert the eyelets and fix them with a press. 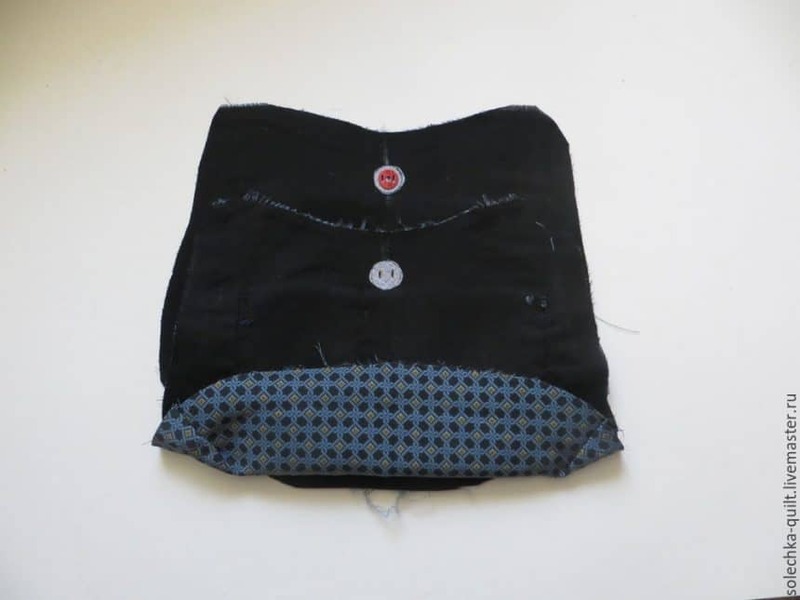 Now we add the two parts of the bag, fastening it to the magnetic button, and draw on the second part the circles for the eyelets already inside the installed ones, we repeat the process of installing the eyelets on the second part. Well, the eyelets are installed. 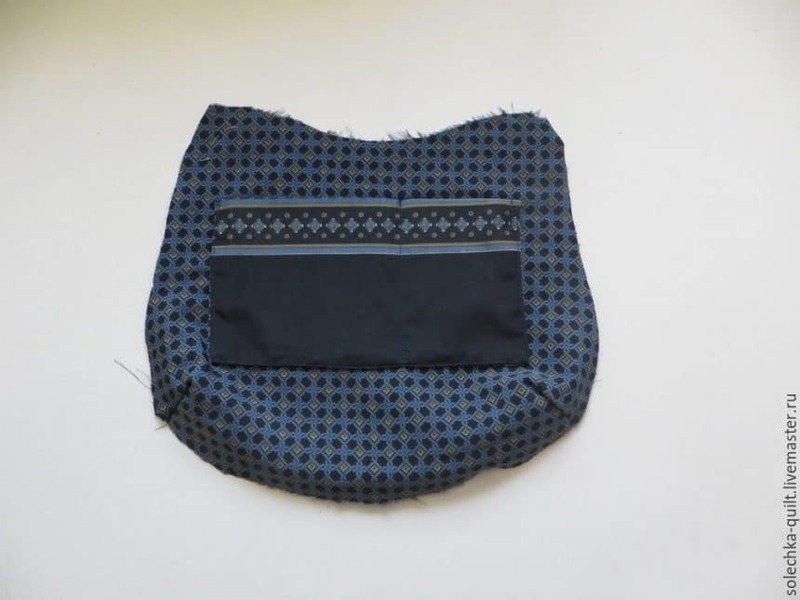 We connect together 2 parts of a handbag, we sew and then we outline them with an oblique track. The handbag is ready. And the knobs can be made here on a regular carabiner, you can stretch a chain through the eyelets, you can weave a pigtail. In general, the options are many, to your taste. 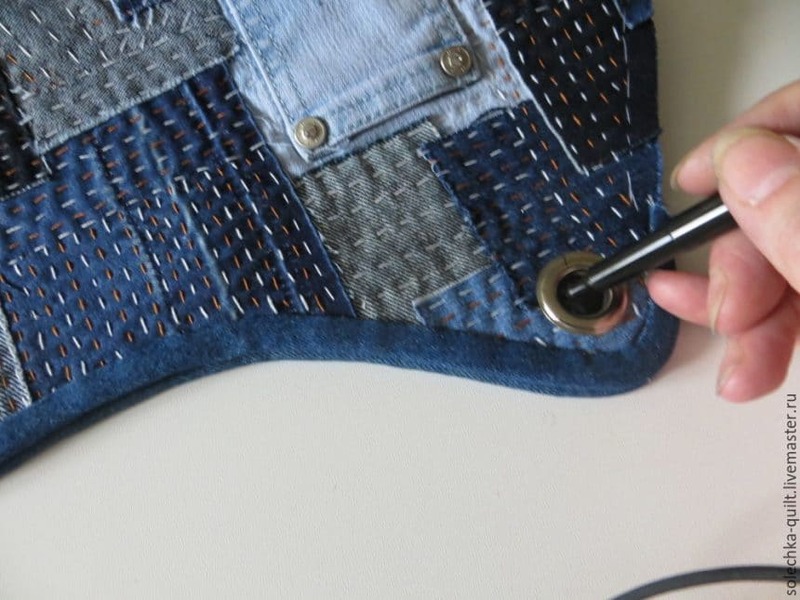 Thank you for reaching the end, I hope you had a desire to try to sew such a handbag with your own hands. How much time it takes depends on your desire.